Phew! The birthday cake turned out pretty good. Ran out of red dye so the red coloured frosting was more like pink, but it was Sunday so no chance to run around finding more dye. MDR was a tremendous help, MB would have been lost without him. 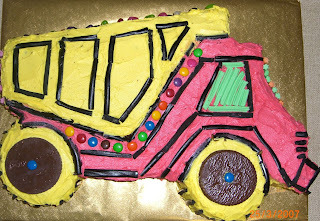 He cut the cake to plan and was a gem at doing the licorice outlines. One of the guests at the party was admiring the cake and asked what MB & MDR planned for next year's party, MDR responded with "I'll be in Tassie". Eljay had a ball, but couldn't quite get the hang of the Pass the Parcel game! Was Wazza @ the party?